A change in ‘cultural identity’ can be quite rapid (think modern Americans who are a mix of almost every nation on the planet) or it can be slow as demonstrated in the Mitchell Case Study which can be downloaded and studied by clicking here. Today, upon commercial ancestral DNA testing males that carries the R-M222 paternal genetic maker will be of American (including African American), Canadian, Australian, and of course of Irish or Scottish origin (to name but a few). Yet they are all the descendants of ‘Celts’ who lived in Mainland Europe and who began arriving in waves into Britain and Ireland from about 800BC onwards. Their Celtic ancestors would have been indistinguishable from those described by Julius Caesar, and their spread into Britain and Ireland almost completely changed the genetic makeup of both islands, virtually replacing the pre-historic inhabitants (think European impact on the Native Americans). By 500AD the founding ancestor of R-M222 was living near the ancient structure of Aileach near the modern City of Derry/Londonderry in the far Northwest of Ireland. A relatively short time after the R-M222-Adam lived, some of his descendants had spread overland through the Ancient Irish Kingdom of Breifne (Leitrim/Cavan), and into Westmeath and as far south as the Galway and Tipperary borderlands, where they would later contribute to ancient Irish Clans like the O’Reillys, Whelehans, O’Mannions and McEgans. However, the most notable spread of R-M222 males began with the arrival of the Vikings in Ireland, whose cutting edge seafaring technology allowed the Gaels of Northwest Ireland to spread into what would become ‘Galloway’ in Southwest Scotland in 1100AD. 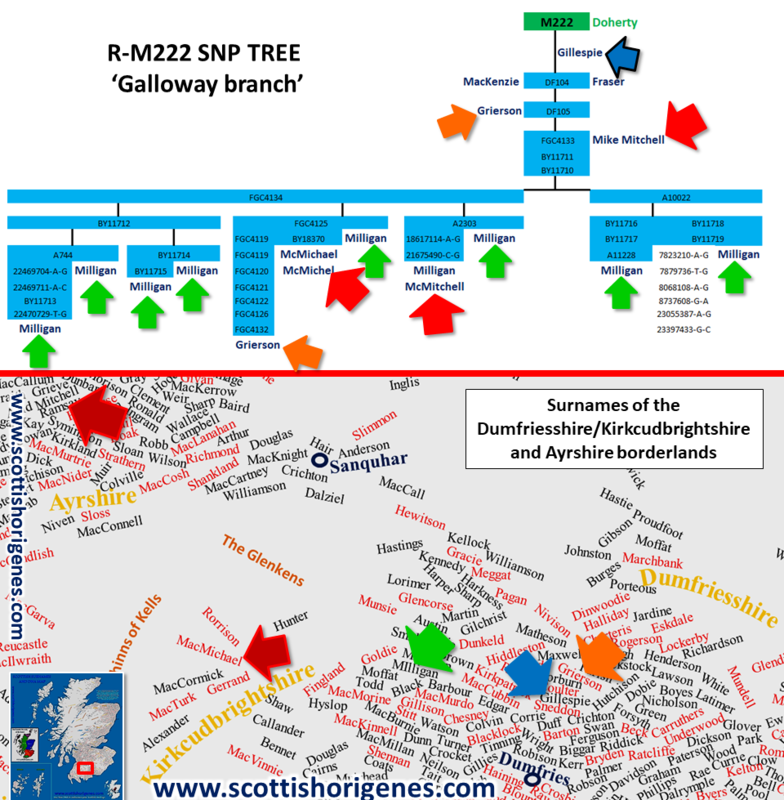 The Irish Gaels took with them to Southwest Scotland their surnames (Mac), language (Gaelic) and their genetic markers (like R-M222). But by 1600AD they had completely changed! 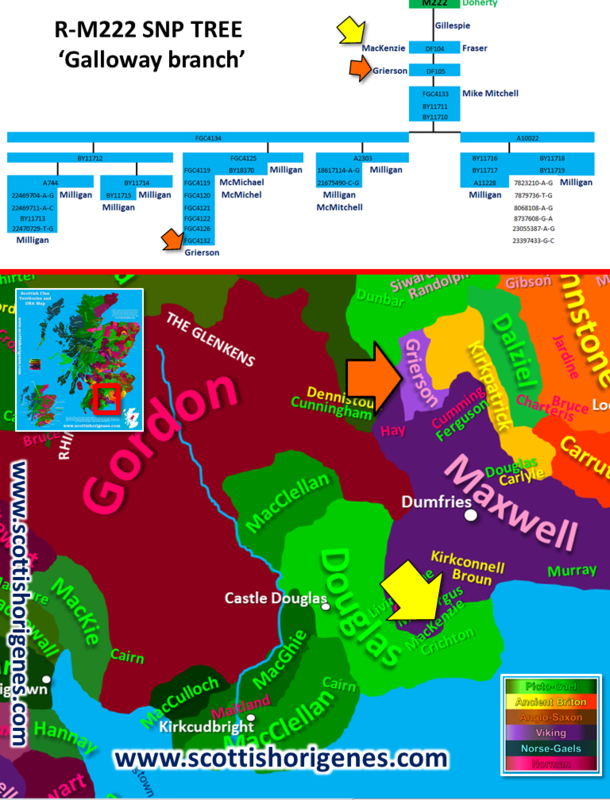 English had become their primary language (Gaelic would be extinct in Southwest Scotland by 1760AD), and although they remained Christian they were now Protestant rather than Catholic, and they regarded themselves as Lowland Scots rather than ‘Foreign Gaels’ (Galloway means ‘land of the foreign Gael,’ Galloway was incorporated into the Kingdom of Scotland in 1240AD). However, their distinctive genetic markers (most notably R-M222) remained in the local population, as did their distinctly Gaelic surnames. But, their surnames were not immune from change; with essentially all Gaelic surnames being extensively anglicised! The Mitchell case study illustrates this quite beautifully. 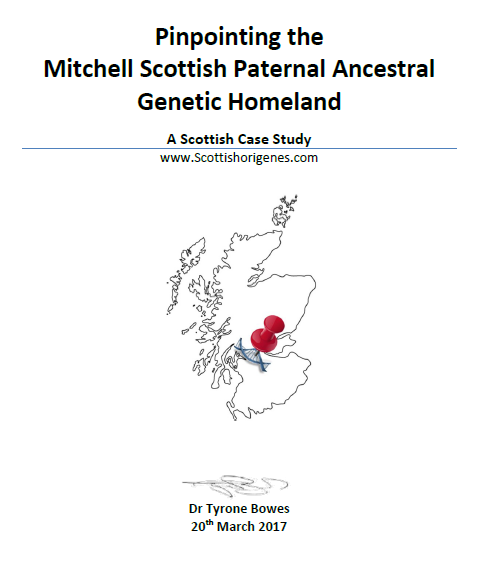 Mitchell is a Norman surname common throughout Britain and Ireland, yet the test subject carries the Gaelic R-M222 marker and his DNA places his paternal ancestry among the Irish colonisers of Galloway. By studying his genetic matches it demonstrates how his paternal ancestor moved from the Gaelic world of Galloway into a Norman area of Central Ayrshire, which also corresponded to his ancestor either willingly or unwillingly changing his surname from Gaelic-MacMichael to Norman-Mitchell. In fact his most recent (Scottish) paternal ancestral genetic homeland lies in an area where Mitchells and MacMichaels live (and farm) side by side. Scottish Lowlander Mitchells and MacMichaels would continue to have lived oblivious to their common ancestry if not for modern DNA science. What will your DNA reveal? If you have not taken a commercial ancestral DNA test but wish to find out what your DNA will reveal then contact Scottish Origenes here (I'll recommend a suitable test). Or if you would like a FREE CONSULTATION on your DNA results then contact Scottish Origenes here. Remember folks, your DNA test results are generated in a scientific lab, using complex scientific equipment and trained scientists. Interpretation of your scientific results should always be left to a professional scientist. ALWAYS CHECK THAT YOUR GENETIC GENEALOGIST HAS A SCIENTIFIC QUALIFICATION! IT WILL SAVE YOU BOTH TIME AND MONEY!